This song was not used as the music for a Psalm. Then, all of a sudden, it was time to leave my home of 30 years and to move back to my real home. After 5 ½ years in Dallas, 4 ½ years in Sugar Land and Missouri City, and 30 years in Katy (actually a Houston address), for a total of 40 years of wandering in the wilderness of Texas, it was time to move back home to Cedar City, Utah. I was told over and over, when I was growing up, the red mud in Cedar Valley gets in your blood, and you eventually have to come home. Mom (Maxine Shirts) turned 90, she needed us home. A temple was announced in Cedar, and within a week we had purchased a condo, which was 2 doors from Mom, and within a month had sold our house at 1307 Emerald Green Lane. The logistics of downsizing was much harder than a scout camp (see Song 028 – Fathers and Sons, Song 029 – Simonton Blues, Song 030 – El Rancho Cima, Song 031 – Camp Strake, Song 032 – Find The Seed, Song 033 – Camp Liendo, Song 034 – Digital Camera, Song 036 – Hagen’s Escape, Song 037 – Brosig, Song 038 – Turners, Song 039- Stephen F. Austin, Song 040 – Ice on Tents, Song 043 – Twelve Disciples, Song 049 – Welcome to Big Bend, Song 050 – Tribes, Song 105 – Kelly’s Pond, and Song 163 – Seminary Trek) or a Science Camp. At least I have had some experience in both of these logistical challenges. 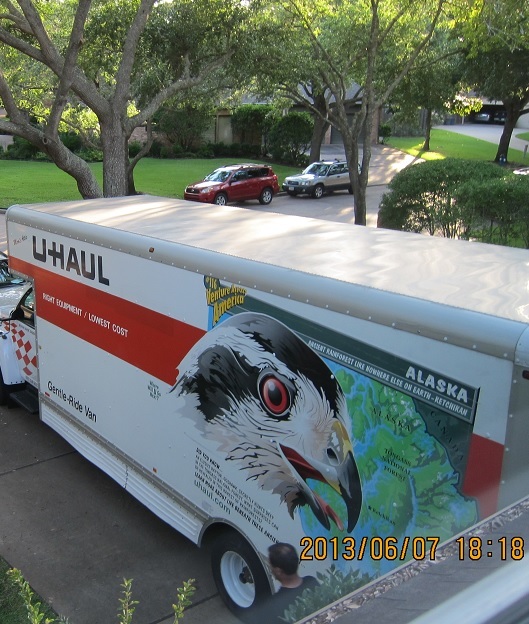 There was a sale at the local U-Haul storage place on Baker Road by our Post Office and the I-10 frontage road. They let you use one of their biggest storage units for a month, for the price of one of their smallest units. By the end of the month you had to move everything into a smaller unit. So we had a 40 foot x 15 foot x 15 foot storage unit to act as a staging area. We cleaned out a lot of the house, putting everything in the large storage unit. Then sold the house the first weekend it was shown, selecting the largest of 6 offers, each above our asking price. 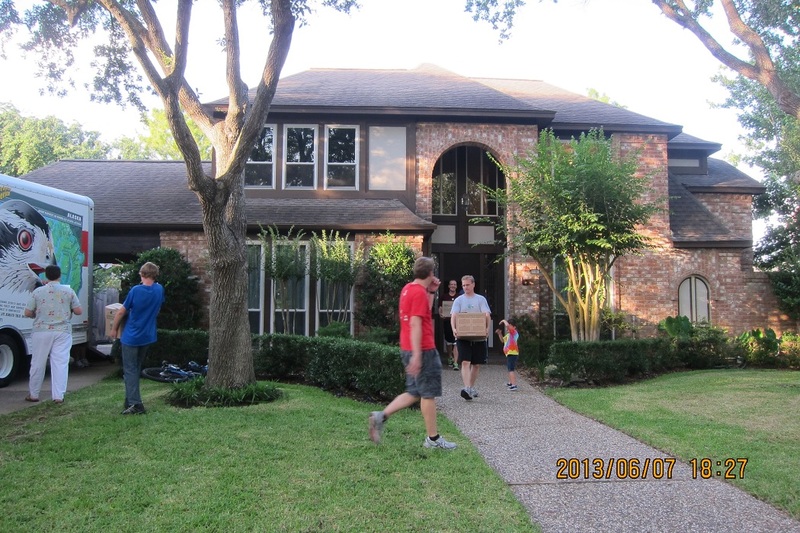 We rented an apartment at the Apartments on Barker Cypress road in the Barker Reservoir, and moved what we needed to have in the apartment to live there. The photo to the left, and the extended photo, show us emptying and loading the rest of what was in the house for the first truck load to Cedar City. I had helped a lot of people move, and it was very nice having kids, and friends show up to help load the truck. We spent about a year with an apartment in Houston and our condo in Cedar City. One of the members of the Hillcrest Ward in Cedar City learned we were living both places and said, “When you decide you are moving here, we will take time to get to know you.” That conversation motivated me to close down the Houston apartment. About a year after we moved into the third-floor apartment (see Song 351 – Enjoy the View), Andrea and I sold our Saturn and drove the second truck with the rest of our stuff in it to Cedar City (see Song 362 – The Move). And thus, we finished our downsizing.